Welcome to St Hubertus & Oak Bay Estate Winery online store. The next best thing to visiting the beautiful Okanagan Wine country. A great way to have some valley sunshine sent direct to your home or business. selection of your favorite St Hubertus & Oak Bay wines at a great price. Did 14 wineries in the Kelowna /Winfield area. Now that I've had all the wine home and duly tested in my own kitchen, St. Hubertus won! Amazing Pinot . Won't pass this place up any time we head to the interior. Favourite!! In 1984 Leo Gebert, originally from Switzerland, came to the Okanagan to start a winery. Two years later his younger brother Andy joined him. Since 1984 the Gebert Family has used sustainable farming practices on their 80 acre vineyard to produce wines that reflects the terroir of the north Okanagan Valley under the St Hubertus (54 acres) & Oak Bay (26 acres) labels. This was officially recognized in 2005 through the Environmental Farm Plan. & in 2017 Organic (transition) certification. 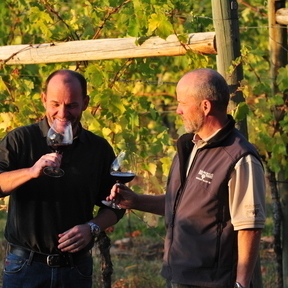 In 1991 the two brothers Leo and Andy Gebert changed direction and started producing their own wines. Today the winery produces on average 14,000 cases of wine annually. All wines created by St Hubertus and Oak Bay are made with estate grown grapes and crafted and bottled on site in keeping with the traditions of an estate winery.